Most people roll their eyes when they need to edit a PDF. Why? Because PDF editing is difficult. After all, the idea behind the PDF is that it’s meant to be read-only and not edited. Have you ever tried adding new pages to your PDF file? Not an easy task without a dedicated PDF tool, right? Sure, you can convert your PDF file to Word online, add the pages in MS Word, then enter text and convert back to PDF, but that is a hassle that takes too much time and kills your productivity. Especially if you have to do it on regular basis. A much better alternative for inserting blank pages to PDF files is to use Able2Extract Professional. This way, you can fully customize the appearance of your document and save valuable time in the process. Insert blank pages is a new addition to Able2Extract’s already impressive PDF editing toolkit. The feature allows you to add extra blank pages directly to your PDFs with just a few clicks. Start up Able2Extract Professional and click on the Open icon in the top left corner, locate the PDF you wish to modify and click to open it. Just click on the Edit icon and Able2Extract will switch to PDF editing mode. To add a blank page to your PDF file navigate to the Pages options in the right PDF editing panel and click on the Insert… button. The Insert blank pages dialogue will pop up. Specify where in your document you want to insert the pages and the number of pages that you wish to add. When you’re done, just click on the button Insert. The specified number of pages will be instantly added. Watch a short video tutorial that will guide you through the whole process. What’s more, you can also further modify your PDF by deleting, moving, resizing, scaling and rotating any page of your PDF. Bonus tip: Able2Extract also allows you to keep your confidential files safe by redacting sensitive data from your PDF documents. A professional PDF suite such as Able2Extract can have a dramatic impact on your PDF workflow. If you’re not already an Able2Extract user, you might want to give it a try. It has all the necessary features for professional and home users alike. You can download a 7-day free trial here. 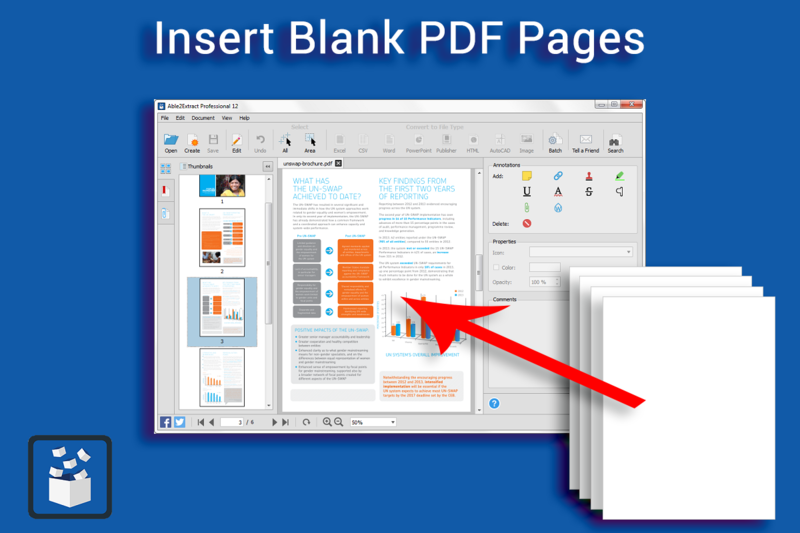 We hope this guide on inserting blank pages into your PDF documents was informative. If you want to read more tutorials like this one, make sure to bookmark our page & follow us on Facebook, Google + and Twitter for updates.